In the heart of Southeast Asia, Laos lies nestled between Vietnam and Thailand. It shares a border with both China and Myanmar to the north, and Cambodia to the south. Three ethnic groups, each with their own language, share the diverse landscape across 17 provinces. Laotians are 67 percent Buddhist, 30 percent Animist, and 2 percent Christian. 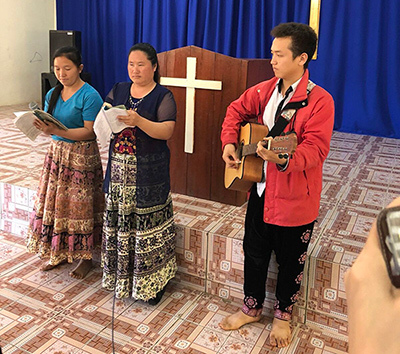 It is this challenging mission field to which Bishop Scott Jones has been assigned to serve as the bishop of the Laos Mission Initiative. 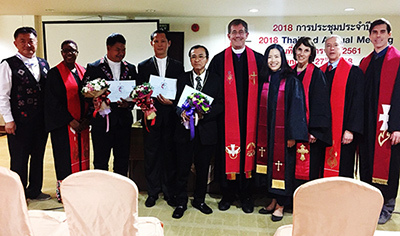 Recently, Bishop Jones led a team to Laos that included his wife, Mary Lou, and four members of the TAC Board of Ordained Ministry: Rev. Romonica Malone-Wardley, Dr. Linda Christians, Rev. Dr. Jeff McDonald, and Dr. Jeff Olive. We are honored to hear from Bishop Jones about his trip, and why we should all be excited about God’s work in Laos. Q: Bishop Jones, please share with us how you became an integral part of the United Methodist Church in Southeast Asia. A: Every United Methodist church has a bishop. We are planting United Methodist churches in Laos and Thailand. Most of the day to day work is done by indigenous pastors under the supervision of missionaries. However, a bishop works with the missionaries to supervise the mission. The Council of Bishops assigned me to be the bishop of these two mission initiatives. Q: What was the purpose of your most recent trip? A: I made this trip to hold the annual meeting of the pastors- one meeting in Laos, and one in Thailand. Last year we commissioned 12 pastors in Laos. This year I taught for a full day covering pastoral care and stewardship. 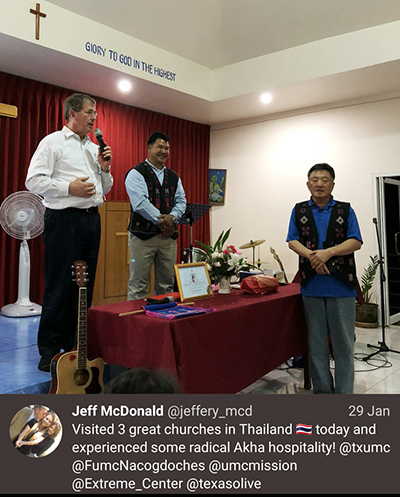 In Thailand, I commissioned three pastors. Four members of the Board of Ordained Ministry of the TAC went with me. They examined the candidates and approved them for commissioning. Q: What is the Asia Mission consultation? A: The Asia Mission consultation was a time of sharing among the people involved in the five mission initiatives in East Asia. In addition to Laos and Thailand we are planting churches in Vietnam, Cambodia, and Mongolia. During the meeting we shared our best practices so that we could all learn from each other. Q: Why are you excited about our work in Southeast Asia? A: We believe that Christ has commanded us to take the gospel to the whole world. God opened doors in both Thailand and Laos and we are building on them. The churches there are small, but we are planting seeds that will make a huge difference in years to come!